After going on hiatus for a couple of years or so from the industry of SSD, we’re glad that Patriot finally got back on track with the release of their Patriot Ignite SSD – crafted for a collection of use cases in PC’s and notebooks which includes gaming, as well as content creation. At some point, the company solely focused on memory and flash media items but now, they have returned with a greatly improved product that is also equipped with the brand new Phison S10 controller. We think that it’s great that Patriot finally returned to the SSD scene with an excellent product to boot. So this time, we’ve focused on the Patriot Ignite SSD to see just how much improvement the company’s made with their latest product, and how great it works based on performance. Patriot Ignite 480GB SSD Review – Whats in the Box? When we got our hands on the Patriot Ignite, we noticed that its packaging is quite simple yet has absolute contrast compared to the look of the SSD itself. You will get to see the appearance of the drive since the packaging has a little window to feature the product which appears to have a black and bright red structure that is completely different from the white and dark blue theme of the container. The Patriot Ignite SSD may have a simple packaging but what’s good about it is the fact that necessary details are written on the front portion. Important information such as the drive’s interface and size is present, as well as its compatibility with both the Mac and PC; a couple of texts also indicate its compatibility with Linux as well. When you flip the packaging, you will notice that the information in front has been duplicated at the back of the container, along with additional details such as where it’s made (specifically in Taiwan) and a text stating that the product comes with a three-year warranty. The packaging is pretty much basic with just a few details regarding the product. There’s really not much to look at so we decided to just head on to open the packaging to see if there are any other items included in this. So far, the SSD has a little piece of paper indicating most of the product’s details, specifications, as well as the installation process; other than that, nothing else fits in this little container so let’s go on ahead with the appearance and construction of the drive. Patriot Ignite 480GB SSD Review – The Need for Speed! This Patriot Ignite SSD that we tried out is a very light product that weighs only 116.2 g, its measurements are 3.94 in x 2.75 in x 0.28 in. If you notice, the drive’s design is the same as the other drives from Patriot which are all made using an all-metal black chassis. The front part of the drive has a black and red sticker that indicates the name of the product, its capacity, as well as the branding of the company; it also shows that it is a 2.5 SSD with a SATA III 6 Gps which allows the product to easily fit in new Ultrabooks and notebooks that need 7mm design. The Patriot Ignite’s body is made of aluminum and in front of this, you will see the company’s branding with a letter “I” that has a flame which serves as the dot of the letter. Behind the drive, there are a few details indicated as well such as the warranty void warning, interface, as well as its capacity. The Ignite also takes the standard profile of most SSD’s: its sides feature two screw holes which lets you easily mount the drive. Take note that the product uses a Phison S10 Series controller which you can find at the front portion of the board which is beside the four NAND package and DRAM chip; if you flip the product, you’ll see the other NAND packages that are neatly aligned. Take a look at the backside of the product where you’ll see all the information that you’ll need such as the model type, serial number, PN’s, and the barcode. Additionally, DRAM on the drive is a 512 MB Nanya DDR3l-1600 pack. We can say that the overall design of the Patriot Ignite SSD is simple yet nice, and generally durable. The Patriot Ignite SSD is generally easy to use, and if you do not want to install the drive as the main OS, you can choose to have it installed as the secondary drive instead. What’s good about this is you can also buy two of the Ignite SSD and use one as the operating system while the other can be utilized for programs, games, and the like. The Patriot Ignite SSD is also compatible with Windows Vista, Windows XP, Windows 7 and 8; it also works on the Mac OS X, as well as the Linux systems. Basically, the drive will cover most of all your undertakings since the drive performs greatly. The Toolbox of the Patriot SSD doesn’t really look that special but it definitely does its job. One of the features that we greatly appreciated is the fact that you do not necessarily need to install the drive since it can run and function as is. When you launch this, it will readily scan the system for drives that are compatible; during the process, you will get the chance to see the serial numbers, health status, and its features as well. A SMART default tab is also present which gives you the drive’s basic health values which is also good since you can readily determine possible troubles and issues in the system. Downloading files and searching for proper firmware is unnecessary since the Patriot Ignite’s firmware upgrade is built-in; this will prevent any form of risks which is common when you download the wrong firmware or files. The SSD also features a Secure Erase function that readily lets you restore the drive; additionally, Patriot also added a feature for optimizing the SSD and system which is very easy to run since you only need to launch this and you’re good to go. We ran a series of tests for the Patriot Ignite SSD, all of which seen impressive results. 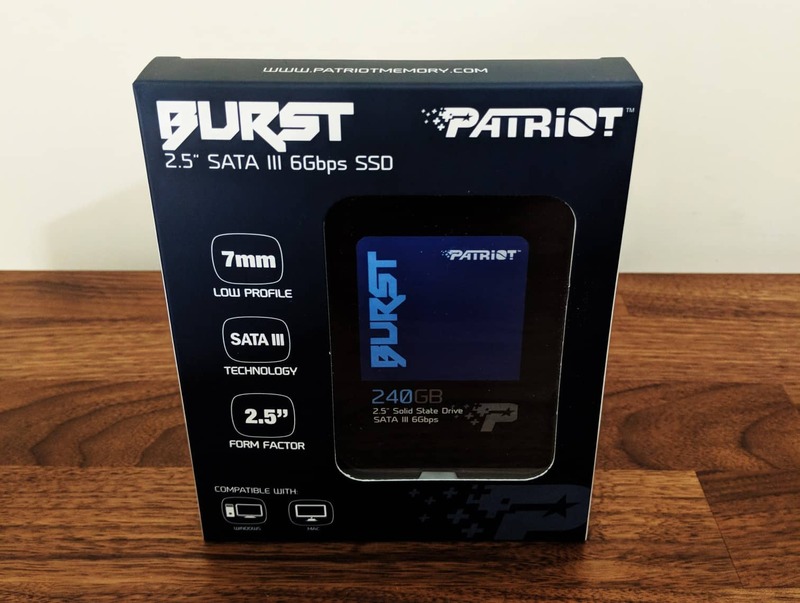 We all know that Patriot is one of the brands that have a long history in the SSD industry and is known for doing well when it comes to producing some of the latest technology in the market. Not only do they provide products that perform well, but they also produce items that maintain a very competitive price. They may have gone quiet for some time on the SSD environment but they’re now back in the industry with their Patriot Ignite SSD. The performance of the Patriot Ignite SSD was generally adequate since it was fast during moderate to heavy usage. Its 480 GB is a great budget option for mid-level users who want to have adequate speed with great capacity. The Ignite SSD also supports an AES 256 bit encryption which is very important for consumers who are primarily focused on security. The design of the drive is fairly simple but with how it’s made, Patriot crafted the drive to make it fit perfectly with most of the systems that are available – we think that this is a great feature since you won’t really have to worry about the Ignite SSD not fitting well with your system. Though simple, it is a fairly durable drive yet seeing it with a solid build quality would be pretty nice too.